Tom is the Head of the Health and Safety team at Park Square Barristers. He is a B-List Specialist Regulatory Advocate and frequently defends cases prosecuted by the HSE and local authorities. He has particular expertise within the construction industry, but has advised and represented companies as corporate entities, directors and individuals from a wide range of industries, at all stages of criminal proceedings. Such cases almost always involve either very serious injury or death. Where there is a death, his instructions will usually be prior to any inquest and he has developed a significant practice in this field as a result. His cases frequently involve complex issues requiring expert evidence. He excels at applying regulations in all manner of specialized activities in order to get the best possible outcome for a client. He has been invited to speak at several large training events at which representatives of many of these insurers have attended – usually technical claims managers, claims directors and claims controllers as well as the Directors of Safety, Health, Environment and Quality of large corporates. Tom has a significant practice representing interested persons before the Coroner’s Court. Although this is most often in relation to cases where there is either HSE or local authority interest, he increasingly welcomes instructions in other cases, where there might be CQC interest or a public law angle. He recognises the sensitivity of such inquiries, which often require the need to balance public perception with the protection of the client. He is frequently required to produce skeleton arguments in relation to the application of Article 2 and the necessity for a jury and is known for his ability to handle particularly sensitive and emotionally charged cases. Johnston – Article 2, jury. Mental health patient who died having swallowed a knife. Represented the InMind Group who ran the secure rehabilitation unit in which she resided. Donaldson – death of an employee whose tractor freewheeled into a quarry whilst he was operating a mulcher attached to it. Acted for employer Company. Taylor – Article 2, no jury. Death in a house fire. Acted for WY Fire & Rescue Service. Tozer – Article 2, no jury. Death of a young man with severe autism and epilepsy who was under the care of Mencap. Represented CYC. Brown – Article 2, jury. Death of an employee when a stack of pallets fell on him from a forklift truck. Represented Howdens Joinery Ltd. Perks – Jury inquest. Death of a security guard at Immingham Docks as a result of a collision with a delivery truck. Tom is a registered lawyer under the FA Football Agents Regulations and has been involved in advising on procedure at county FA level. 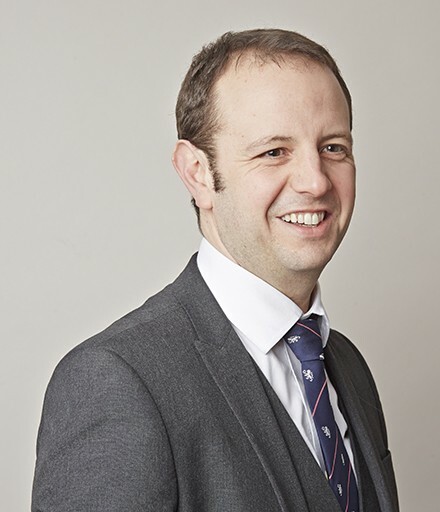 He is also a registered lawyer with the RFL and has an excellent understanding of all the rules and regulations across a wide spectrum of sports. HSE v TATA Chemicals Europe Ltd. and Capper Industrial Contractors Ltd. – Allegation in relation to work within a confined space at a lime plant in Cheshire. HSE v Dufell Roofing Limited – Construction. Issue as to whether a roof’s construction meant it should be regarded as a fragile surface. HSE v Rhino Precast Limited – Construction (non-fatal fall from height). CDM Regulations 2015. City of York Council v Jacob Rowntree Housing Trust – allegation against care home following the suicide of an elderly residen. HSE v Neesam & Son Limited – Construction. Freestanding wall allowed to fall on employee, causing death. HSE v Altak Limited and AP & HC Barber (a partnership). For second defendant, charged with s.3(1) when a bolt flew from a ramp mechanism that he had designed, killing an employee of the first defendant. HSE v St Helens Bistro (a Partnership) – Death of a customer who entered a private cellar door in a Public House and fell down a staircase. HSE v Lightwater Valley Attractions Ltd. and David Geary – Severe injury to a child on a rollercoaster. Nottingham City Council v Hodgson Elkington LLP – Severe injury to member of public when travelling on a faulty escalator in a shopping mall. Bradford City Council v Rosegarland – s.3 allegation against a care home when an elderly resident had fallen to her death down an unguarded staircase. R v Waterfall – allegation of manslaughter made against a farmer whose bull was alleged to have killed a rambler in a field with a public footpath. Calderdale Borough Council v Oasis (Hebden Bridge) Ltd. and DHL Supply Chain Ltd. – death of employee of second defendant who fell down an unprotected staircase whilst delivering to a retailer. Tom Gent may accept Public Access work, where he can be instructed directly by a member of the public rather than a solicitor. On the 16th of January 2019 Newton Aycliffe Magistrates’ Court heard how, in October 2017, a self-employed labourer was working for two self-employed bricklayers sub-contracted to Darlington Borough Council. The labourer was walking past the front of the building plot at Allington Way, Darlington, when a pack of roof trusses fell on him..
Knowsley Engineering Services Ltd prosecuted by the HSE following an investigation into the incident on 30th June 2014. Members of Park Square Barristers’ Regulatory and Public Team were recently invited to a discussion evening about the current Sentencing Guidelines Council consultation on sentencing for health and safety offences.